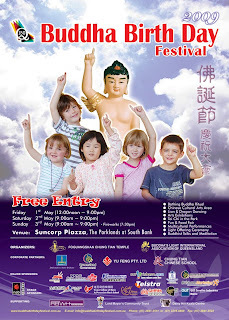 Over the weekend we went to a festival celebrating Buddha's birthday which was held on the South Bank which is an area on the south bank of the Brisbane river opposite the city centre. It is an area with gardens, a piazza and a ferris wheel. Quite similar to the south bank in London only with better weather! There were lots of stalls selling all sorts, food and all things chinese. We went to two talks by a buddhist nun, she was very good and it set us thinking about the meaning of life, the universe and everything.